Hurricane Sandy sent us some pretty stiff winds, so I thought I would write up a few techniques I use in my garden to care for tropicals after a heavy wind event. I’ll break it down by the type of plant.. 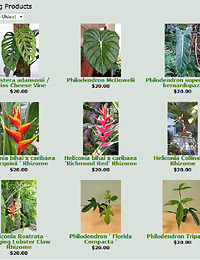 When a big storm brings in winds over 30 mph, heliconia can get whipped around depending on where they are sited. A few things can happen, including shredded leaves, bent stalks, broken stalks and bent leaves. I’ll discuss how to handle each below. 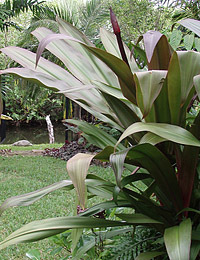 Shredded Leaves: A heliconia can get its leaves shredded and continue on without any real problems. However, after a storm you might get sick of looking at tattered leaves, so some cleanup may be in order. The first thing to keep in mind is which leaves are OK to cut, and which one you do NOT want to cut. The most important leaf to keep intact on a heliconia is the NEWEST LEAF which would be emerging from the top center of the stalk. If you cut this leaf down to the stem, the clump will abort the entire stalk. So it is critical to leave this leaf at least partially intact so that the next leaf will emerge and the stalk will continue on its way towards blooming. If the center leaf has bent over, what I do is try and leave it hanging there until the next leaf has emerged. At that point, the bent leaf is no longer the newest emergent leaf and can be trimmed off. If the bent center leaf is pretty big and flopping around, you can cut the LEAF in half or so.. just don’t cut it down to the stem- keep some leaf intact, and the stalk will not abort. Older Leaves: Older leaves can be trimmed back or cut off. I always try to keep as much leaf material as possible, however, to maximize the plant’s ability to photosynthesize. If half of the leaf has yellowed, or looks tattered, what I do is fold the leaf in half along the center like a taco shell, and then use scissors to make an angled cut (angled from the leaf tip back towards the main stalk) to remove the tip of the leaf. Folding and angling the cut back towards the stalk creates a cut that looks more attractive and “pointy” – making the cut less noticeable. Small leaves towards the bottom of the stalk that have yellowed I simply cut off completely. I usually try to keep at least the three newest leaves on a stalk whenever possible, even if I have to cut one or more of them in half as described above.. their stems will help protect the new emergent leaves. If the stalk has just tipped over from the ground, and isn’t bent I always try to keep it, and will just brace it up with a support. My all time favorite support for the tropical garden is REBAR. I’ve tried all the bamboo stakes, plastic plant stakes, etc, and nothing beats good old rebar! It is super strong, won’t bend or break down. It lasts forever- I’m still using rebar to support my plants that I bought over 6 years ago. What use is 3/8″ rebar in 4 foot lengths. These cost about $2.50 at the hardware store (in the concrete section) it’s worth the price because once you have them, you’ll have them forever. I grab some green Rustoleum spray paint and give them a good coat of paint to protect them from rust and to color them green so you won’t notice them in your garden. I also grab a roll or two of green plant velcro. This is all you will need. A good supply of 8+ painted rebar stakes and velcro will come in handy for years. Back to the tipped over stalk- I take the 4 foot rebar and place it near where the stalk is in the ground, and angle it the way I would like the stalk to be standing. I push the rebar down into the soil, being careful to feel if I’m stabbing it into some rhizome. If I think I’m hitting rhizome under the soil, I’ll try another spot. Once I have the rebar pushed in about a foot or two, I just cut some plant velcro and tape the stalk up to the rebar. I often do this for stalks that have naturally leaned over, to keep them out of paths, etc. Not always just from a storm. Often, you can velcro a couple stalks to the same stake if need be. Folded Stalks: If a stalk has completely folded over, you have a couple options.. if the stalk is part of a clump with lots of other good stalks, and doesn’t seem to be all that close to blooming size, you can just cut it down and let the plant spend its energy on the other good stalks. Just saw it off about 4 inches above the soil line. If you happen to notice a little black dot in the center of the cut stalk, you made the right decision, because that dot tells you the clump was aborting the stalk anyway. Completely Battered Clumps: If you have had a serious storm such as a strong hurricane, your heliconia clump might have just gotten completely nuked. No stalks are standing, everything is knocked over and torn to shreds. Don’t panic- your heliconia is just down, not dead! Go ahead and cut off all the stalks about 4-5 inches above the soil, being careful not to cut any little baby stalks that might be peeking out of the soil and still in good condition. Keep it DRY: At this point, the clump has had almost all of its leaf matter removed. This means that it can’t transpire moisture at anywhere near the same rate it was doing when it had alot of big leaves. It’s pretty much down to the rhizomes in the ground- and you don’t want these getting too wet without the ability to adjust itself. So what you want to do now is keep that area of your yard hot and dry until new stalks with big leaves have re-emerged. Cut back on the sprinklers, and don’t water it with the hose. You’d be suprised how hot and dry you can keep heliconia rhizomes and they will sprout. In fact, when I start a heliconia from a rhizome, I pretty much cook it in a very hot sunny spot until it has gotten going. Chances are the storm that knocked your clump down has also dumped a ton of rain on your garden- this is another reason to cut off the water on your rehabilitating clump.. its wet enough! Pre-Emptive Storm Prep: If you know a big wind event is about to occur and you’ve got some nice blooming stalks in your garden, you can stake these stalks up with rebar ahead of the storm, and quite often they will get through it without any problems. You can even put a few rebar stakes around the outside edges of the entire clump and tie the whole thing up with rope or velcro to protect it from the winds. Costus gingers such as Barbatus and Red Buttons are usually pretty resistant to wind and won’t fold over as easily in a storm. 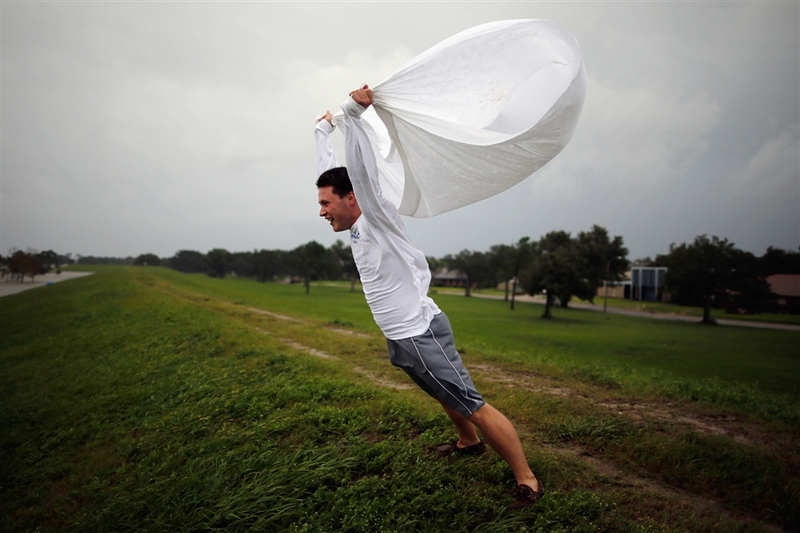 You can always stake these up ahead of a storm as described above. If you get a folded over stalk, stake it up with rebar and keep an eye on it- often before a clump of Costus aborts a stalk, it will grow little baby “plantlets” near the tip of the stalk. You can let these grow for a bit and then cut them off and plant them- either back at the base of the clump, or in another location. If you don’t want to waste a rebar stake on a bent costus stalk, you can push it over onto the soil and partially cover it up to see if it puts out any babies before that stalk finally gives up the ghost. If you don’t see anything after a month or so, you can toss the dead stalk. Leafy gingers such as Dwarf Alpinia (red ginger) can get bent stalks, but are usually so fast to push out new ones, that I often just cut off bent ones unless they are quite mature and look like they are flowering or close to it. In that case, you can stake up the stalk and let it bloom. Alpinia are pretty dense clumpers and staking/wrapping the entire clump ahead of a storm is a good way to keep it protected. If the entire clump gets completely trashed, follow the instructions above for a nuked heliconia clump, and remember to keep the rhizomes on the dry side until new leaves emerge. The nice thing about Alocasias and Xanthos is that they are usually grown for their foliage, rather than blooms- and they are constantly growing new leaves. So if you have a big storm and it rips up your Alocasia’s leaves, you can trim off the lower ones, keep some of the newer ones and just wait a bit for the next perfect new leaves to come out. Before long, your plant won’t even look like it got mangled in a storm. If the plant was pretty big with a nice trunk, and the storm was strong enough to break it in half- I cut it at the break, attempt to plant the growing end in a pot (this only works sometimes) and then keep the lower part (still in the ground) DRY until some new leaves have emerged. 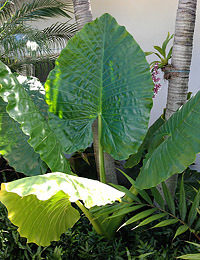 Alocasia and Xanthosoma grow from underground tubers, which are similar to rhizomes, and will regrow if the top is cut off. A bent over Alocasia/Xantho can always be staked up with rebar. To prepare for a future wind event, you can put in some rebar stakes and tie up all the leaves to them with rope or velcro. Since Alocasia leaves can get quite big, you can wrap the whole plant in a *breathable* fabric such as an open-weave burlap to try and keep the leaves from getting torn up. Just be sure to remove the burlap as soon as the wind passes so you don’t cook the plant. These plants are usually pretty resistant to strong storms, with most damage being limited to tattered leaves. You can cut off or trim down any ratty looking leaves, just be sure not to mess with the new emergent leaf. Whatever might happen to the newest leaf, just leave it alone and let the plant sort it out over the next month or so. If you plant was climbing up a structure or trunk, such as Monsteras like to do, and it got blown off, you can use plant velcro, rope or even something like liquid nails to get it back in place. Then give it some time to regrip itself. If a trunk gets broken off, you can attempt to root the growing end in a pot (only works sometimes) and then make a nice clean cut where it broke off from the lower part of the plant still in the ground. Over time, you should see new shoots growing off the piece in the ground, likely more than one, which will create a fuller looking plant in time. Trees can be a bit trickier to deal with after a storm- often the best technique is to try and stabilize them before the winds start. Hardware stores have tree staking kits than can be OK, however a post hole digger and some 2×4′s firmly inserted into the ground can be of great help. But let’s assume you didn’t do this, and your tree is either tipped over or broken in half. If the tree is tipped over, you want to try and get it standing back up as soon as possible. Sometimes this is just a matter of pushing it back in place and stabilizing with some 2×4′s, etc. Other times you might need to dig around the rootball, fully saturate the ground around the roots with water from your hose and try to “rock” it back up.. you may need some help to do this. 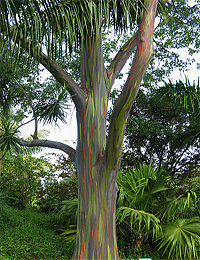 I have not had a Rainbow Eucalyptus break in half from a storm, but I “get the feeling” it would grow new branches below the cut/broken area, and keep on going. I have not tried this myself, however.. this is just a theory I have based on seeing what happens when I cut off large branches. I have had to right a tipped over Rainbow, and that worked out just fine. A few notes on October to November gardening in Florida- the weather is starting to noticeably cool off, and as a result, your tropicals will require less water. This time of year I start backing off on the days I run my sprinklers. Not all the way, but I’m letting the plants dry out a bit more. By December into February, I am watering them mostly from rain only- and will run the sprinklers only for a short time maybe once a week if its been very dry. The reason for this is that as the weather gets cooler, on into true cold, the tropicals will go into a semi-dormant to dormant state. During this time they are not as active as they are in the growing season and this, along with cold temperatures, can make them more susceptible to fungal rot. Fungus need wet conditions, and keeping your tropical’s rhizomes and tubers on the dry side will help keep any rot at bay. I also fertilize at this time with a fertilizer high in “K”or potassium – (the third number). This helps harden off the plant for colder weather. You don’t need much Nitrogen this time of year (the first number), and you really never need much Phosphorus in Florida (the second number). I look for a fertilizer with a high 3rd number and try for plenty of magnesium, manganese and iron. If you are using a simple time release such as Osmocote, you can apply a little more now, and you should be good until the Spring. I also start putting down mulch in October and November. 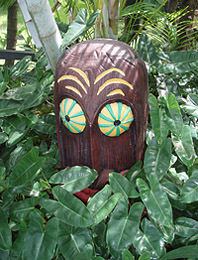 Mulch acts much like a blanket to keep your tropical’s important rhizomes warm. Not only is mulch a physical barrier from cold, but it also creates heat as it breaks down.. ever pick up a bag of mulch and noticed that it’s actually warm? Another addition to consider for your tropical garden in the winter is annual Rye Grass. Not everyone needs to do it, but if your garden is like mine, with lots of shade, St. Augustine is likely starting to look patchey and brown by late October. All the recent rains don’t help it much either. By November, I like to throw down some Rye Grass seed. It creates an instant green-up in the grassy areas of the garden, and provides a much different look than St. Augustine. I get a big 20 lb bag and mix it up with compost in a garden cart. I get a large piece of cardboard, and carefully spread some compost/seed mix by hand around the edges of my plant beds, using the cardboard as a shield to keep the seed from getting in the beds (rye grass in the beds can look messy/weedy) Once I’ve done all the edges, I just spread the rest around in the grassy areas, making sure I don’t get any in the beds. Water it down, and in a week or two, the garden is full of brand new, lush, soft and bright green rye grass- and it will stick around until April or May.